The new Blur Gallery in Photoshop CS6 offers tools that provide intuitive and creative ways to manipulate depth of field and create bokeh effects. Photographers rely on focal length, subject distance and aperture to determine in-focus and blurred areas of an image. Yet there are times when technical constraints make a desired effect difficult to achieve. And that's where these new tools come in handy. Unlike the blur options in previous versions of Photoshop, the Blur Gallery filters are designed specifically to produce a selective focus effect. 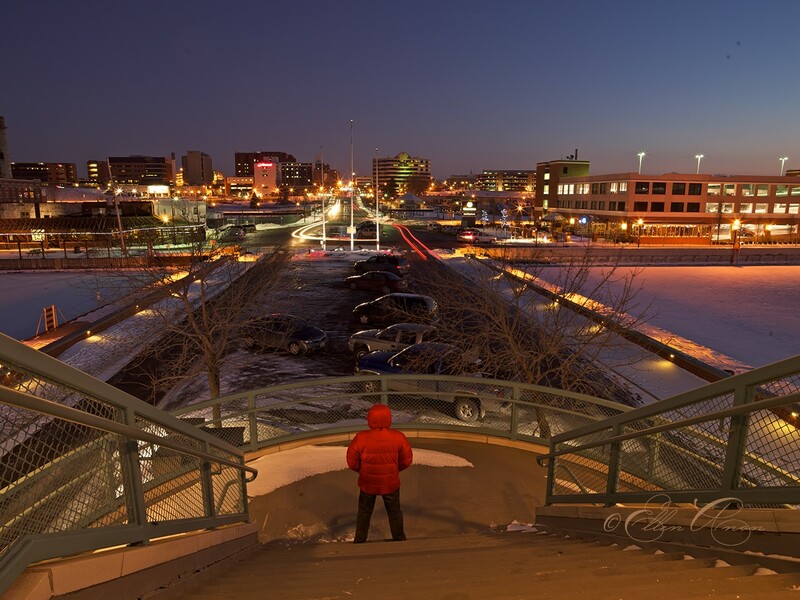 The Blur Gallery is comprised of three filters; Field Blur, Iris Blur and Tilt-Shift. In addition there are a separate set of Blur Effects that let you create specular highlights mimicking the circular bokeh effect produced by lenses. In this article I’ll show you how these tools work and hopefully inspire you to start using them on your own images. You can find the new blur tools by going to Filter>Blur. Selecting one of the top three options (highlighted in red) will open the new Blur Gallery. The Blur Gallery opens in a full size window that temporarily replaces your regular workspace. Panels along the right give you access to all three of the blur filters as well as bokeh adjustments. Because the blur filters are applied directly to the image pixels, rather than as a layer adjustment, I strongly recommend that you first duplicate the background layer of your image before applying any of these filters. If your image already contains multiple layers, select the topmost layer and merge the visible layers into a new additional layer by pressing Command + Shift + Option + E (Ctrl + Shift + Alt + E on Windows). 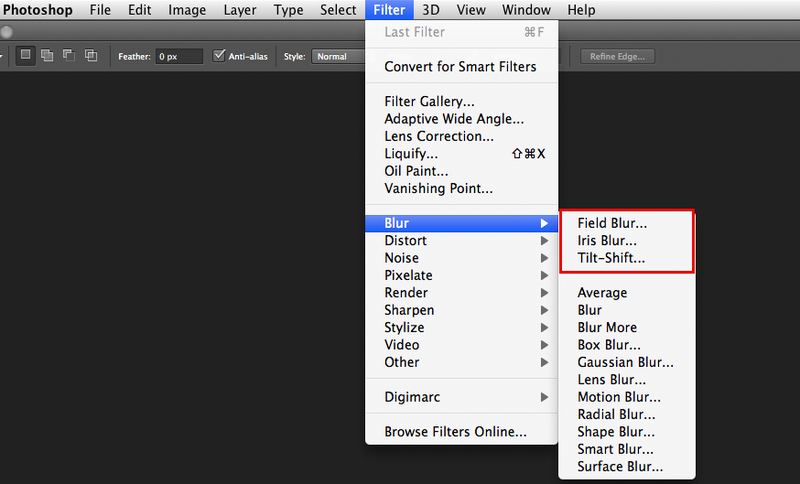 Then go to Filter>Blur and choose either Field Blur, Iris Blur or Tilt-Shift.) This will open the Blur Gallery. Field Blur is the simplest of the three filters to use, but offers the least amount of direct control. When you select this option in the Filter menu, the image opens in a full size editing window. An active 'pin' is automatically placed in the center of the image, surrounded by an adjustment ring (the gray circle partially covered in white). 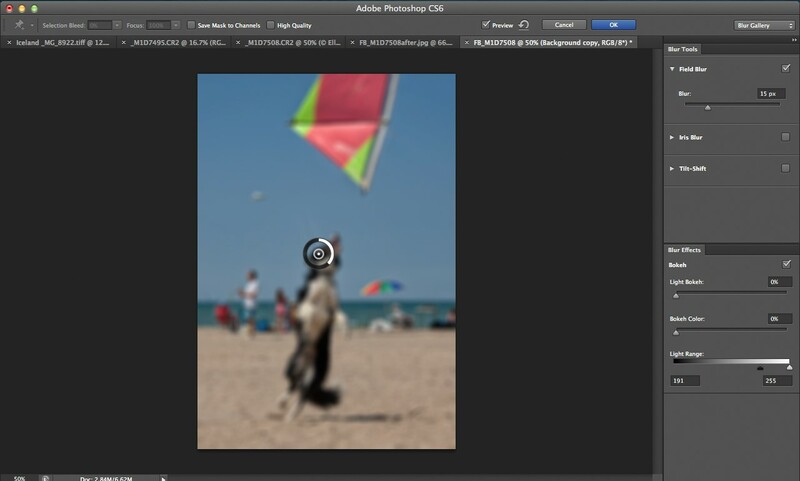 At this point the entire image is blurred to the degree specified in the adjustment ring. Field Blur opens with a 'pin' placed in the center of the image surrounded by an adjustment ring that applies a blur to the entire image. With your cursor on or near the adjustment ring you can drag your mouse along the ring's edge to adjust the blur amount. 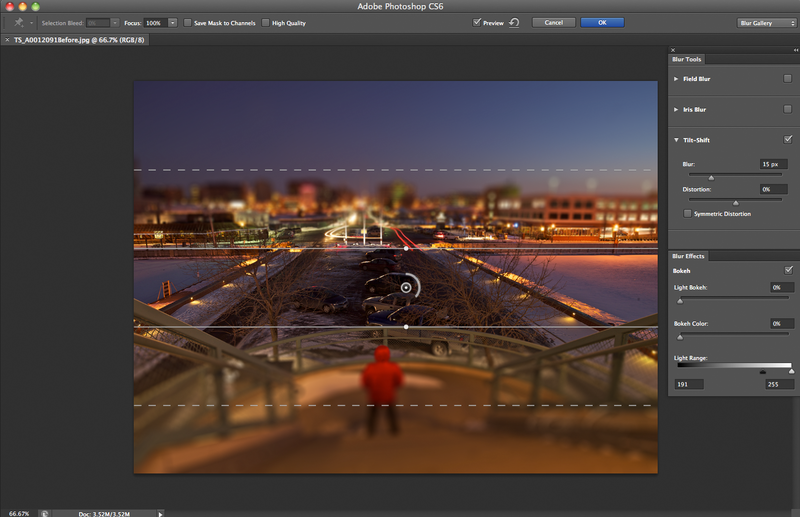 You'll see the blur value update (an example of of CS6's 'rich cursor' feature) as you move the mouse. 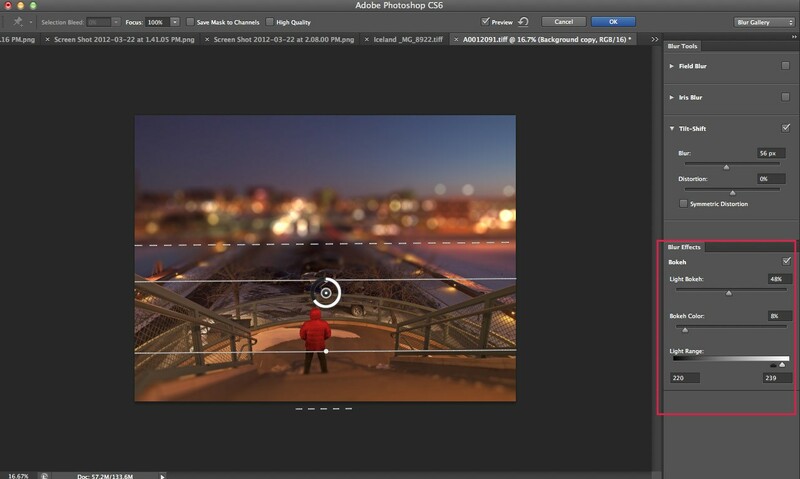 Alternatively you can use the slider in the Field Blur panel. OK, so we've made the entire image blurry. Big deal. The fun starts as you add additional pins to the image. Move your cursor away from the adjustment ring and you’ll see the cursor now appears as a small pushpin with an plus sign alongside it. In this 'add pin' mode, simply click to place a new blur control so that you can specify a different blur intensity at that image location. A blur setting of 0 prevents any blur from taking place, protecting or masking out that area of the image. Place two pins on a single image and Photoshop creates a linear gradient that makes a smooth transition between the effects of each pin. Place three or more pins and Photoshop then constrains the effect of each pin to the image area in its immediate vicinity. You can place as many pins as you like on an image. You can apply as many pins, at varied settings as needed to apply blur to some areas of the image while protecting areas you wish to remain sharp. Press and hold the M key to see the actual blur mask. Areas in white have a blur applied to them while areas in black have been protected. Shades of gray represent partially affected regions. You can see that I've added a lot of pins in this example in order to restrict the blur effects to specific areas of the image. Note that each pin can be set to its own blur value, so the real value of Filed Blur comes if you're prepared to place and adjust multiple points on an image, which admittedly can take time to get the precise results you're after. Here's the original image. The background is distracting. 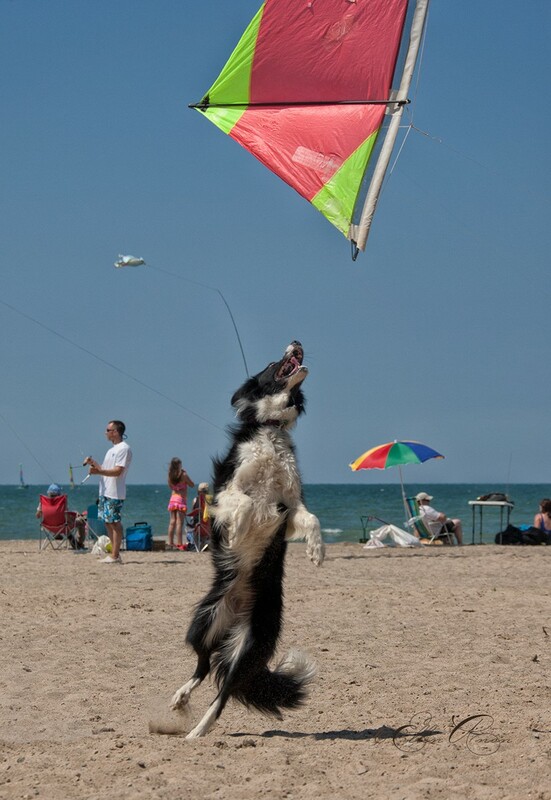 Using the Field Blur I was able to slightly blur the background, drawing attention to the dog chasing the kite. I was able to create a gradual transition in the amount of blur on the sand by applying several pins at different intensities, but this also required numerous pins to protect the dog. Images like this one with complex elements like the 'flying' fur of the dog call up some limitations of the Field Blur tool. If you look closely you'll find areas around the edges of the subject that will require some clean-up work with Photoshop's clone/healing tools. While this may seem like an awful lot of work, one of the things I like best about Field Blur is that it tends to lead to more realistic results with natural-looking transitions that looks as if they could have actually been done in-camera. 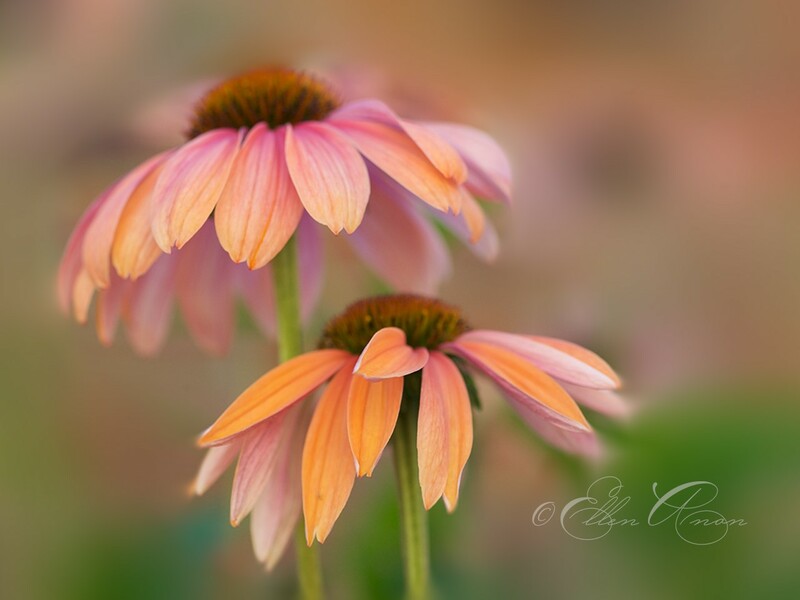 The Iris Blur filter, which we'll examine on the following page, can produce results with less effort. Yet it is very easy to produce an overdone result that any experienced photographer will recognize as a post processing edit. The Iris Blur filter offers comprehensive onscreen controls for designating both the location and intensity of the blur effect. Upon first glance, the controls may appear rather simplistic. After just a bit of exploration, however, you come to realize they are quite powerful and flexible. I’ve labeled the filter's various controls in the example below. The outer boundaries of the ellipse define the start of the transition between the area to be blurred and the area to be protected. The feather handles define the actual portion of the image that is to protected, remaining in sharp focus. The ellipse and feather handles can be adjusted independently. 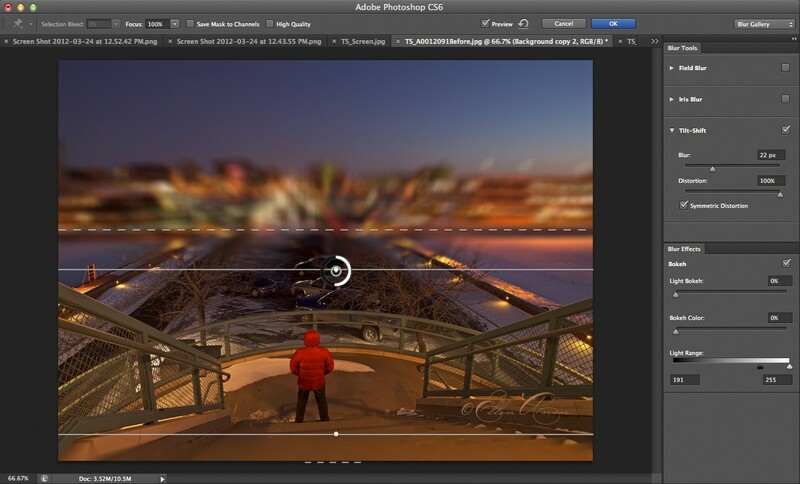 As with the Field Blur filter, you control the intensity of blur by dragging on the adjustment ring or by moving the Blur slider located in the right panel. Once activated, the Iris Blur filter automatically sets a pin in the center of the image. The primary control point is the ellipse surrounding the pin. The area outside the boundaries of the ellipse will be blurred at full strength. There are four Ellipse Handles (small squares) along the ellipse as well as a larger Roundness Knob. Click on a handle and drag to alter the height or width of the ellipse. Click and drag on the Roundness Knob to change the corner shape of the ellipse from an oval (shown above) to a rounded rectangle (shown below). Here I dragged the Roundness Knob to change the shape of the ellipse to a rounded rectangle. Hovering the cursor alongside an Ellipse Handle and dragging will rotate and/or resize the ellipse. Clicking and dragging inside the ellipse repositions the entire control unit. The Feather Handles encompass the area to remain completely protected from the blur adjustment. They also define the scope of the transition gradient between the protected area and that with a partially applied blur. The further away these handles sit from the edge of the ellipse, the more gradual (and seamless) the blur transition. Click and drag on any single Feather Handle to move all of them as a unit. You can adjust a single Feather Handle by holding the Option/Alt key as you click and drag. Confused? Don't be. This behavior is much harder to explain to to actually use. The easiest way to start is to simply move these handles right to the edge of the portion of the image that should remain in focus. Make even minor adjustments to the Feather Handles and you will see the transition from partially blurred to non-blurred areas update. Here's the original file. Even though it was shot wide open, the background remains distracting. 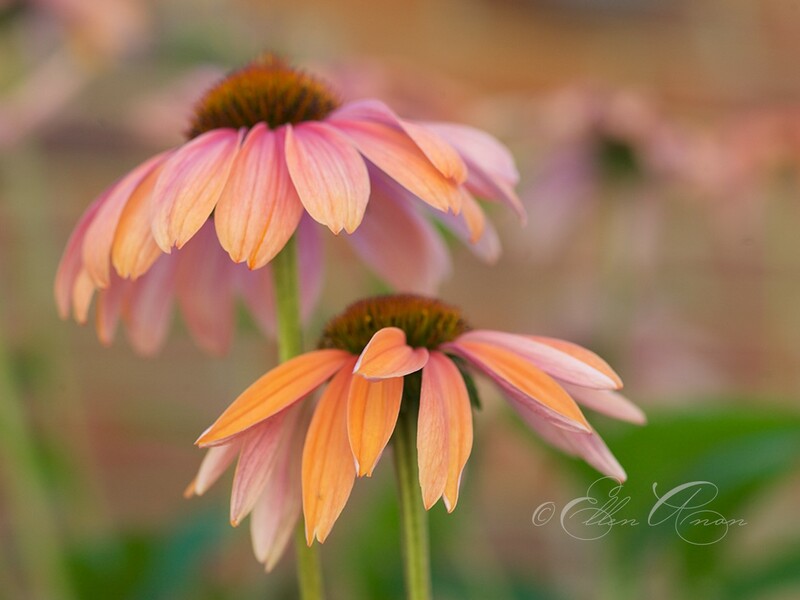 Using Iris Blur I was able to soften the background while keeping the subject in focus. The Tilt-Shift filter emulates the optical effects of extreme perspective control lenses, like those made by LensBaby. When you first open the filter an adjustment ring is placed at the center of the image with a set of horizontal lines appearing on either side of it (see below). The filter opens with a pin in the center of the image. Here I have moved the entire control unit down and adjusted repositioned the dashed lines. The bottom dashed line now sits below the image area, as indicated by the truncated set of dashes (circled in red). The dashed lines establish the boundary between completely blurred portions of the image and the start of a transition to the protected image area which sits inside the solid lines. The simplest way to think of this is that the portion of the image to be protected from the blur must reside within the solid lines. You can move the entire control unit by clicking and dragging on the pin. You can also move the dashed and solid lines independently by clicking and dragging on any of them. Although the filter opens with a horizontal tilt adjustment, you can rotate the entire control unit by clicking and dragging just outside the small circle located in the middle of either solid line. As is common in Photoshop, you can constrain your rotation by holding the Shift key as you drag. 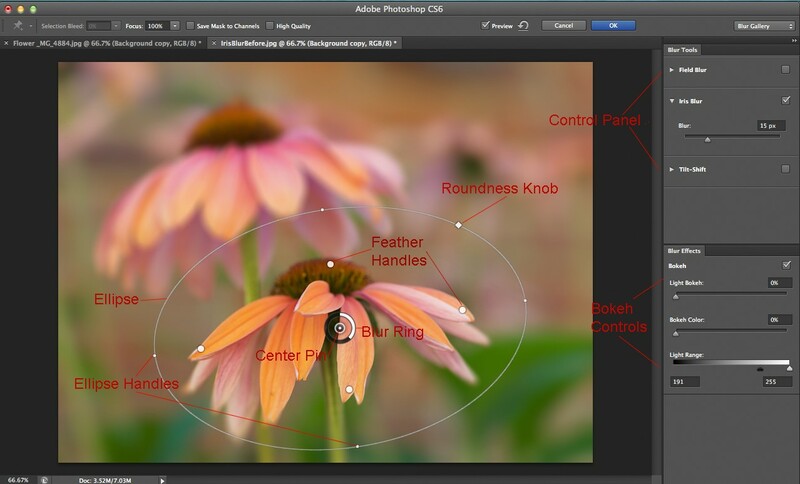 A 'rich cursor' display (new to CS6) will appear indicating the current angle of rotation. As with the previous filters, you control the intensity of the blur by dragging either the adjustment ring or by moving the Blur slider in the right panel. The panel on the right side of the interface includes a Distortion slider, which by default is set to 0%. Moving the slider in either direction will add a motion blur effect to the area that by default would be the foreground in a horizontal image. Note that if the control unit is rotated 90 degrees clockwise then this 'foreground' area will then sit on right. The Symmetric Distortion check-box causes this distortion to be applied to both sides of the blur effect. 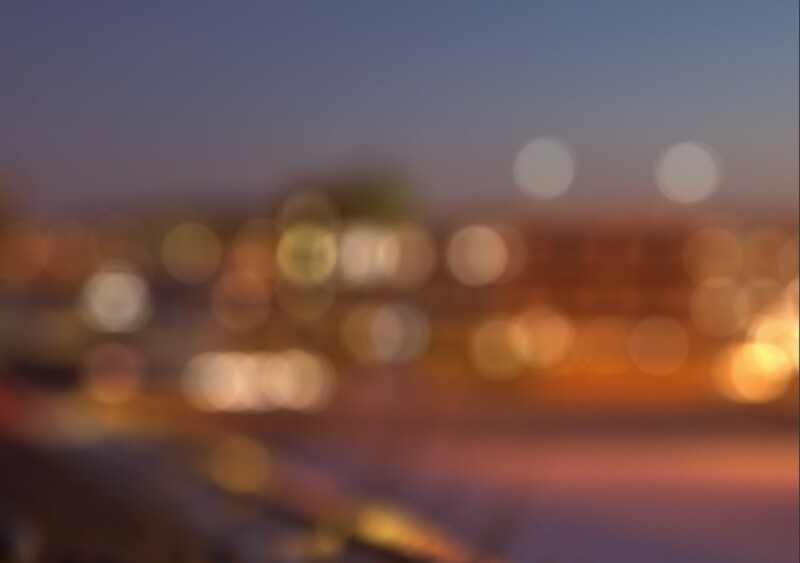 Moving the Distortion Slider adds a motion effect to the blur and bokeh, as you can see in the top portion of the image. The direction of the motion is linked to the direction that you move the slider. In addition to the options displayed under the Blur Tools panel for each filter, there is a separate Blur Effects panel (shown below) that contains three controls governing bokeh, the rendering of out-of focus areas. With these bokeh tools you can convert out-of-focus areas into specular highlights which mimic the shapes traditionally created by a camera lens' aperture blades. Adjusting the Bokeh sliders (highlighted in red) transforms out of focus areas into specular highlights. The first slider, Light Bokeh, controls the intensity of the effect. Higher values will make the effect more pronounced. A second slider, Bokeh Color, lets you boost the saturation of the bokeh. With the Light Range slider you specify the range of tonal values that will be affected by the first two effects. Moving the black and white triangles to luminance levels between 0-255 sets end points for the darkest and brightest pixels to be affected by the first two bokeh controls. Here's the initial image. Depth of field is deep and the scene is quite 'busy'. 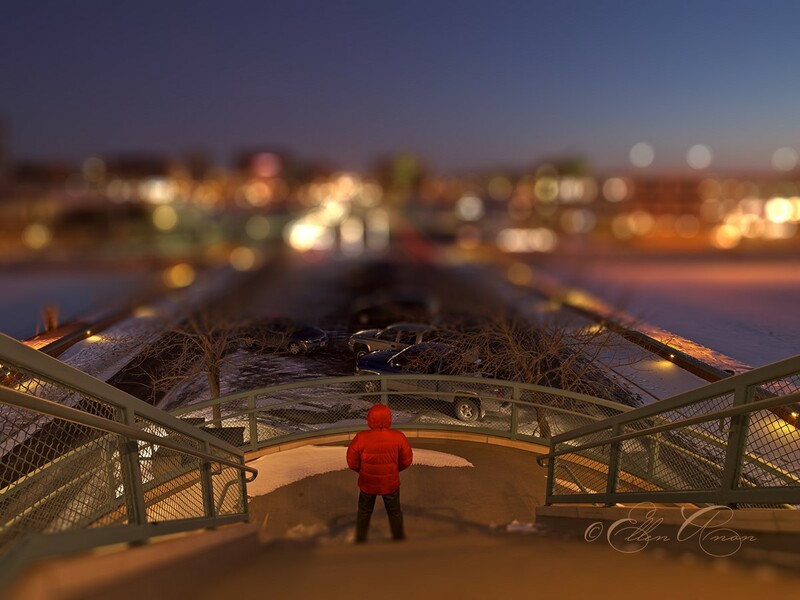 Here's the image with Tilt-Shift and Bokeh effects applied. It's now clear just where the viewer's eye is meant to be drawn. Here's a closeup of the Photoshop-created bokeh. The effect is impressively close to 'genuine' optically-created blur. 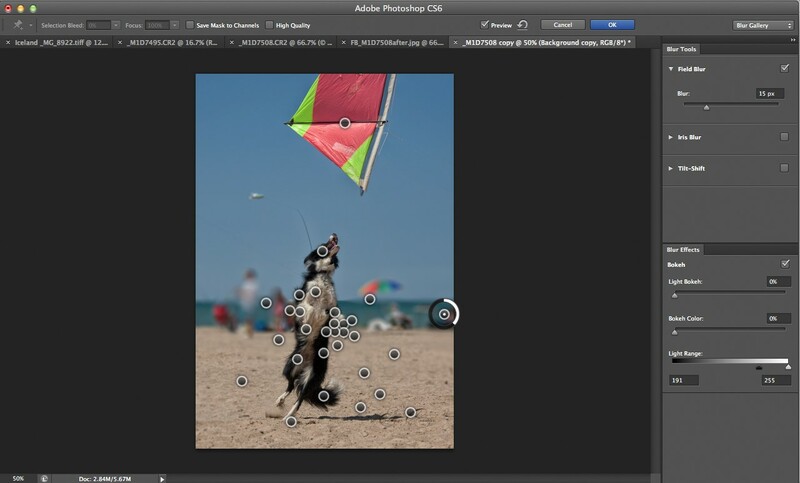 Add additional blur pins to the image and set the blur value of each independently. Delete a pin by clicking on it and pressing the Delete key on your keyboard. Press and hold M to preview the selection mask. Press and hold H to hide the onscreen controls. Enable/disable any of the blur filters by deselecting the check-box to the right of its name. In addition, there are more options located at the top of the Blur Gallery window, shown below. There is a Save Mask to Channels check-box. If selected, a mask based on your filter adjustments will be saved in the Channels panel. 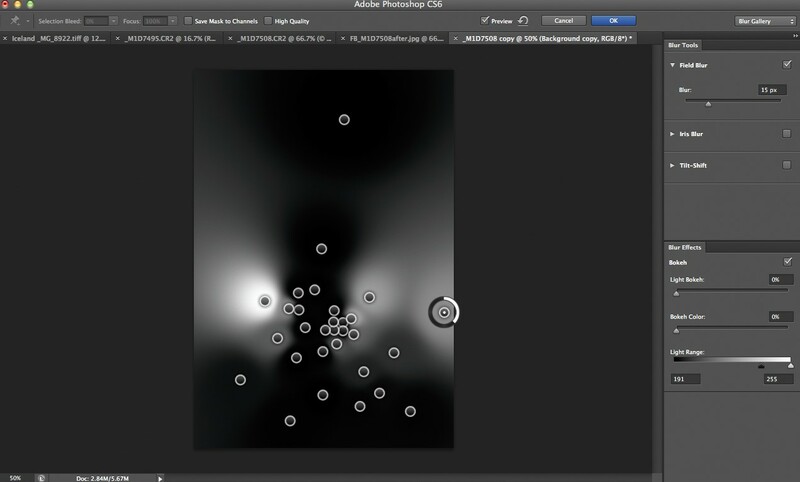 You can reload this mask at any time and use any of Photoshop's tools to apply additional blur. Along the Blur Gallery window's options bar lie additional controls (highlighted in red) for fine-tuning a filter's results. A Focus pull-down menu is, by default set to 100%. You can lower this value to decrease the original focus of the protected area(s) of your image. Should you have a selection active when you invoke the Blur Gallery, you can change the Selection Bleed value to control the amount of blur that feathers into the selected area. 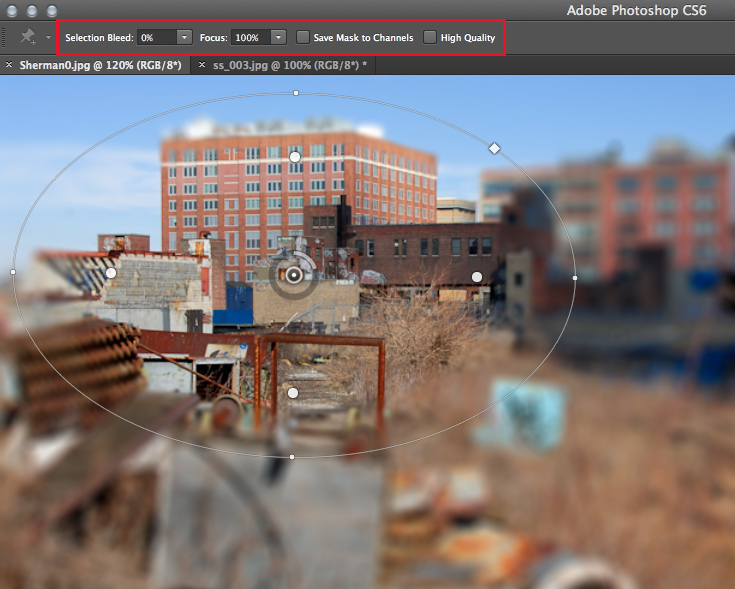 And finally, there is a High Quality check-box that enables a more accurate preview of any bokeh effects you apply. Keep in mind that enabling it likely means slower performance. Now that you've seen a range of uses and controls for these new filters it's time to begin experimenting with them on your own images. While you're not likely to need to use all three on a regular basis, you can probably find one that suits your needs whether your aim is for a more traditional or surreal result.